Over the past couple of years I've gotten more and more excited about Christmas. I think it has something to do with a toddler running around that makes the spirit of Christmas come alive. Everything is magical in her eyes even if she doesn’t understand what’s going on half the time like: decorating cookies, the dancing Snoopy we have to play 15 times at Lowe’s and annoy everyone that walks by, Christmas lights, and Home Alone (ok, that last one was more for me and Jeremy than Quinn but she’ll love it when she gets older)! I also love that we get to see our families at Christmas! That’s definitely pre-travel Elisha talking… My family lives 18 hours away and we have moments of insanity when we decide we will drive to visit… with a 20 month old. Exactly. But that’s not the point of this blog post, it’s really about the anxiety I face when we go to see Jeremy’s family. Now before you put on your black robe and become Judge Judy because I made that comment, it’s because his family is huge and full of boys! And I have small panic attacks every time I’m forced to buy gifts for all of these guys. Which got me thinking, I know that if I have that much trouble picking out gifts, guys must have a much harder time. The end. So that’s why I’ve compiled my Top 20 Christmas Gifts Guide! It’s for you guys out there (or ladies who need to drop a swift and direct hint) who could use a little extra encouragement during an already stressful and busy time of year. You should be spending more time playing the dancing Snoopy, eating errr, I mean decorating cookies, and watching Home Alone with your loved ones. Some of these things are tried and true and I recommend them because I have them and they’re awesome. You shouldn’t live your life without them and I guarantee would make an amazing gift for any woman in your life. Others, I want, nay I NEEEEEEEED! So Merry Christmas, happy shopping, and from the bottom of my type “A” personality heart, do it early. 1- They're Real Mascara by Benefit $23: This is the single best mascara ever made in the world forever of all time. I use it. I love it. It's worth every penny. It lasts forever. And Sephora is carrying The Real Steal which is actually a real steal for $24, so if you're going to get this product get the steal, it's worth it. 2- Tangle Teezer $8.99: If you only bought one thing off this entire list I'd pick this one. I can't even describe how much I love this product. If you've every dreaded combing out your hair or used hand fulls of conditioner at a time, you'll love this little guy. Best stocking stuffer of the year award, right here! 3-Twilight Bath Bomb by Lush Cosmetics $6.25: This is one of the many bath bombs, bubble bars, and bath melts, that Lush offers. If you have a bath taker on your hands, I recommend Lush products. They can be broken and used for several baths and leave your skin really soft. Some have glitter, some change colors, and some don't smell the greatest so read the reviews or check them out in person but a major win for a bath lover. 4- Replica Beach Walk by Maison Martin Margiela $125: Yes, it's a major splurge. However, I got a sample of this in the mail when I was restocking on my They're Real Benefit Mascara, and I couldn't get over how much I liked it. And I'm pretty picky when it comes to scents but this one is a keeper. I'm almost afraid to tell people about it (I'm talking to you, MOM) because I want to keep it all to myself. 5- 2015 Les Fleurs Wall Calendar by Rifle Paper Co. $22: It's pretty. Do I have to say more? 6- ARS Light Pruners $23: These are the best flower shears when you compare price with quality. I've been around the block when it comes to trying out flower clippers and these are my go to. I warn everyone that they are seriously sharp and not playing around so you have to be on your A game at all times when using them. 7- Gold Floral Tattoo designed by Rifle Paper Co. sold on Tattly $6 for a set of 2: I purchased the Rosa collection when it first came out on Tattly because I'm a wimpy mom who would never go through with actually getting a tattoo. I'm weak, indecisive, cheap, and I don't like things that are permanent....because I'm indecisive. It's a vicious cycle. All that to say if you're like me but want to pretend like you could totally pull of a beautiful flower tattoo then you should try these on for size because they will make you stare at you arm ALL. DAY. LONG. And one of mine lasted for well over 10 days. Another amazing stocking stuffer! 8- Slate Waxed Mini Bib Apron by Birdkage $94: I realize this is a mega splurge. And please don't stop reading my top 20 gift guide because I put this on here. First of all, I have a thing for quality aprons. Number 2, this is like the holy grail of all aprons! If you know someone who gets wet, pricked, poked, stabbed, breaks glass, pricked again, bleached, and poked at work on a daily basis, then you know that they want a waxed canvas apron. Why? Oh...I'll tell you why! It repels water and deflects all the poking, stabbing, pricking, bleaching, etc. And at the end of the day, you can just whip out the can of wax that comes with it and shine 'er up! I don't have one, but I'm day dreaming about it right now! 9- The Flower Recipe Book $14 on Amazon: This is a great book. I have it and there are a couple of other editions including the recent The Wreath Recipe Book written by the owners of Studio Choo, an amazing flower company. It's a beautiful book to look at and be inspired by. A great edition to any flower lover's library. 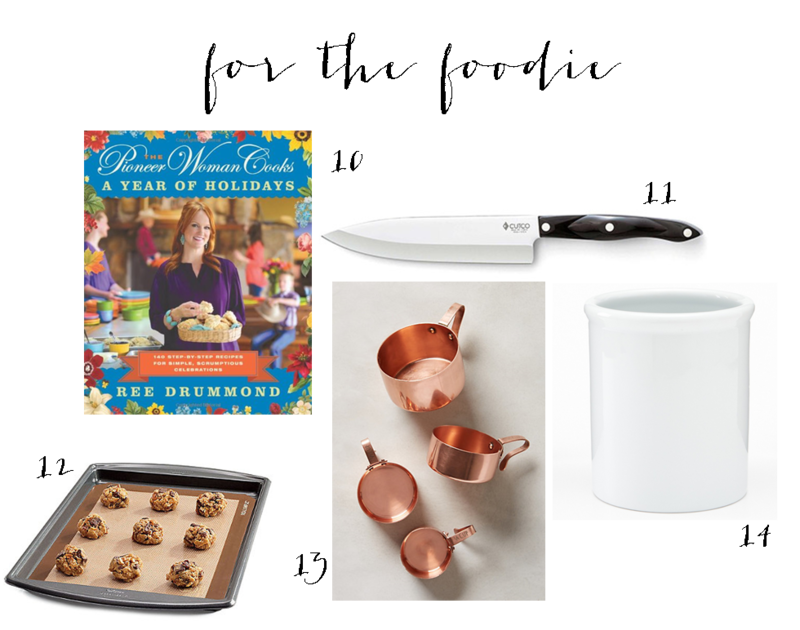 10-The Pioneer Woman Cooks: A Year of Holidays $20.75 on Amazon: This is actually on my Christmas list this year (fingers crossed Secret Santa family member who draws my name...ahem). I've recently tried a few recipes from her blog out and man, oh man. Every time I'm a hero. I was slightly torn because Ina Garten just came out with her new book, Make it Ahead but ya gotta go with your roots and I've never worn a sweater draped over my shoulders and tied in a knot like a country club, tennis playing, "check out my yacht" northerner so, sorry, Ina, next time. 11-Petite Chef Knife by Cutco $123: Ok, now I know I'm getting wordy and I'll reign it in but this one needs some explaining so I'll try to be brief but it's not a splurge. It's worth every last penny. I got suckered into a whole presentation by a Cutco representative one time and felt slightly pressured into buying a knife. So I bought one. Obviously, these things aren't cheap. Jeremy almost killed me with it later for spending so much money on it but I promise you it is the best knife we've ever had. It's a forever warranty, so you can pass them down to your kids and they will fix/replace them, etc. for free and you can ship them in to have them sharpened too. It's an amazing product and they say that most accidents occur from using dull knives so let's remedy that! 12-Professional Silicone Baking Mat by Real Simple $14.99 at Bed Bath & Beyond: I got this last year for Christmas and it's a new kitchen staple. If you've ever made a recipe that told you to butter wax paper... hahaha...oh man, that's hilarious. Just don't. 13-Russet Measuring Cups $28 at Anthropologie: Because I'm not the biggest fan of gimmicky measuring cups or salt and pepper shakers. Sometimes, you just need classic and simplistic. 14- White Porcelain Utensil Holder $9.99 at World Market: These should come in sets of 2 because like Martha Stewart said, "You should have one for metal and another food wood" and that's exactly what I have next to my stove. They're crisp and clean. 15- Custom Engraved Brass Disc Necklace by Onastazia Designs $25 on Etsy: Onastazia is a friend of mine who has beautiful hand-lettering engraving skills. I just got one of these with "Quinn" engraved on it last week and I wear it almost everyday. 16- Custom Calligraphy Return Address Stamp $26 on Etsy: There are lots of great options on Etsy for a custom address stamp so browse around but I asked for one last Christmas and it always makes me happy when I use it. In fact, I think Jeremy likes using it more than me. And it takes a lot less time and is always more legible than my chicken scratch. 17- The Best Yes by Lysa TerKeurst $9.83 on Amazon: The tagline of this book is, "Making wise decisions in the midst of endless demands". I just bought this book and I haven't made it past the first chapter but I've heard from so many people I trust that it's a "must read". 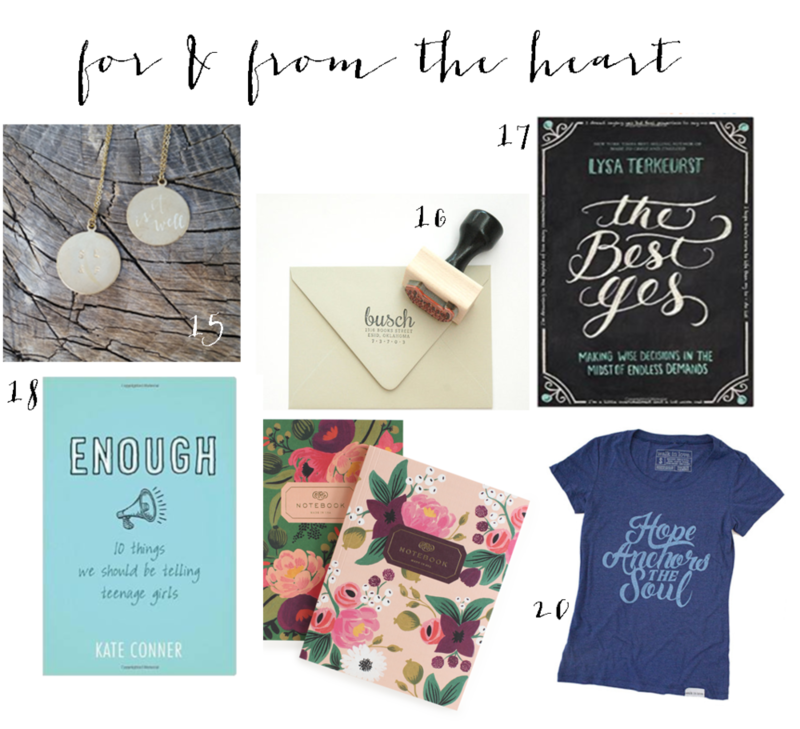 18- Enough: 10 Things we should tell teenage girls by Kate Conner $13.88 on Amazon: Kate was my college roommate and she is incredibly talented, funny, and wise. I would definitely recommend this book for any pre-teen or teenage girl. It's witty, honest, and the perfect Christmas break read for any teen stuck inside a full house! 19- Vintage Blossom Notebooks by Rifle Paper Co. $14.00 for a 2 pack: I know this could have gone under the flower lover section too and you're catching on that I love Rifle Paper Co. but if you have a journaler on your hands swoop these up, they're not your run of the mill journal. 20- Hope Anchors the Soul Tee from Walk in Love $25: I love Walk in Love. They have great clothes and a great message, which is a reminder to imitate God by loving others every chance you get. They're also great people that I love. So a whole lot of love going on here. Brooke & TJ continually make inspiring clothes and this "Hope Anchors the Soul" tee preaches to me! Check out all their stuff in the Walk in love Shop.